Bored with sandwich which is bland and not spicy? 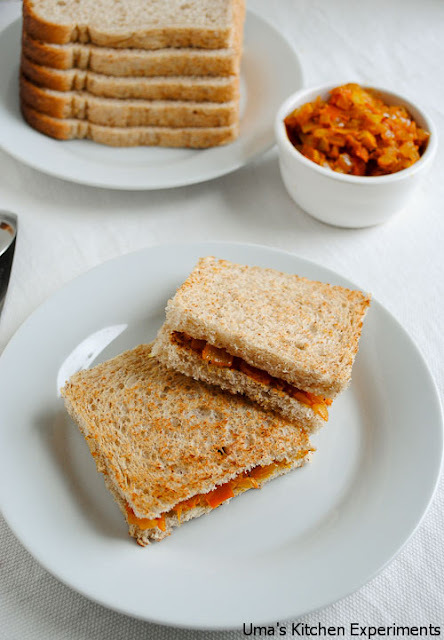 Here is a simple spicy stuffed sandwich which is easy to prepare and tasty to eat. 1) Remove the brown edges of the bread using knife. 2) Take a wide pan and heat oil on it. 3) When oil is warm enough, add mustard seeds and urid dal. Let the seeds pop up. 6) When onions turn translucent, add tomatoes and fry the mixture continuously until the tomatoes are mashed completely. 7) Add salt and red chili powder to the pan and mix them well. Cook for 5 minutes and turn off the flame. 8) Now apply butter both the sides of the bread and gently heat them. 9) Lay two roasted breads on a plate and spread the Onion Tomato mixture evenly to cover the whole surface of the bread. 10) Cover both the breads just like a sandwich. 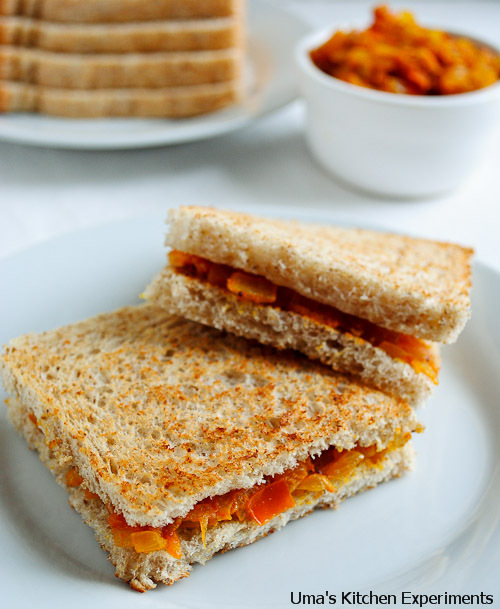 11) Your simple bread sandwich is ready.